The financial, environmental, and community benefits of solar energy systems make them very attractive. Still, a solar photovoltaic (PV) system is a significant upfront investment. Even if you decide not to purchase your solar PV system in cash, solar financing options like a $0-down solar loan or solar lease/PPA can help you go solar and save money on your electric bill. Solar loans are a great solar panel financing option if you want to buy your system. With many solar energy loans, you can finance the entire cost of your system. These loans may be secured (using your property as collateral) or unsecured. Your monthly savings on your electric bills should be greater than the loan’s monthly payment, allowing you to start saving money fast. Save 40 to 70 percent on electricity costs over the lifetime of your system, as compared to doing nothing, by choosing a loan as your solar panel financing option. Solar loans have the same basic structure, terms and conditions as other home improvement loans. Some states even offer subsidized solar energy loans with below-market interest rates. By buying your system outright, you are eligible for financial incentives like the federal investment tax credit (ITC). Interest on secured solar loans may also be tax deductible, which means additional savings on your income taxes. 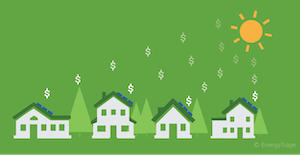 Learn more about solar loans, or consult a list of providers offering solar loans. Solar leases and power purchase agreements (PPAs) are similar to renting your solar PV system. They give you many of the financial benefits of installing a solar power system without having to pay for it. With a lease or PPA, the third party owner (TPO) will install solar panels at your property and, in exchange, you will agree to pay them a below-market rate to use the solar electricity for the term of the agreement. Choosing a lease or PPA as your solar panel financing option will help you to save 10 to 30 percent per month over your utility’s electricity bills without any upfront investment required. The TPO will be responsible for maintaining the solar panels, and, at the end of the lease, will either remove them or sell the system to you at their fair market value. Because the TPO owns the solar panel system, it – not you – will be eligible for all rebates, tax credits or other incentives offered by the government and your utility. Learn more about solar leases & PPAs, or consult a list of companies offering solar leases/PPAs. Explore all of the solar financing options available to you, including solar loans and solar leases and PPAs, before you decide on a financial product. Every situation is different, and what is best for your property depends on a wide range of factors. The EnergySage Solar Marketplace offers side-by-side comparisons and a network of qualified solar installers to provide the information you need to ensure that you receive the best value for your solar energy system.